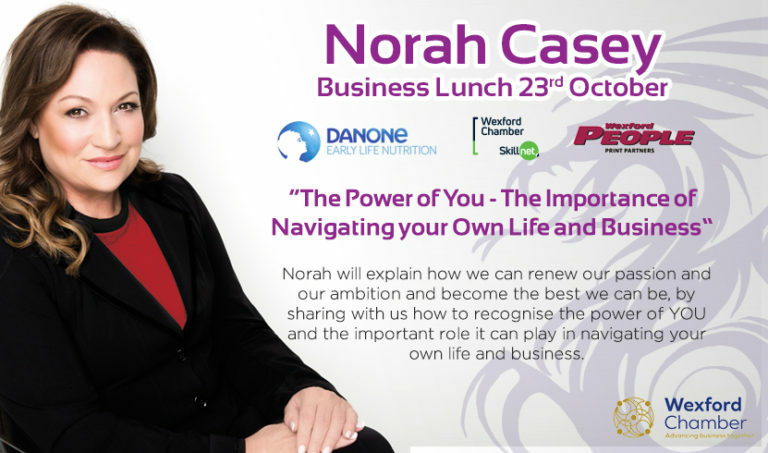 Broadcaster and Publishing Entrepreneur Norah Casey is coming to Wexford on Tuesday 23rd October as keynote speaker at a Business Lunch in Ferrycarrig Hotel hosted by Wexford Chamber, sponsored by Danone Nutricia and Wexford Chamber Skillnet and supported by Media Partner Wexford People. Drawing on a mix of personal insight and the wisdom of twenty years as a top business woman, Norah will explain how we can renew our passion and our ambition and become the best we can be, by sharing with us how to recognise the power of YOU and the important role you can play in navigating your own life and business. Make sure to reserve your seat in the Ferrycarrig Hotel on Tuesday, October 23rd for what promises to be a most engaging event. Booking early is advised as this will be one of the highlights in the Chamber events calendar! by emailing traceymorgan@wexfordchamber.ie or by contacting Wexford Chamber on 053 9122226. Events Cancellation Policy: Cancellations will be accepted up to 72hrs before each event. Cancellations made within 72 hours of event will be subject to a cancellation fee equal to 50% of the agreed cost. Cancellations made less than 48 hours before an event will not receive a refund due to expenses incurred on your behalf. Registrants who fail to attend the event will be charged 100% of the full fee. This policy applies to all events.